I have large, black bags under my eyes and no matter what I purchased, or did, it did not seem to disappear. This product amazed me at how well and easily my bags disappeared. I recommend this to everyone. The price is totally worth it. This is my go to concealer when I either need to cover up dark circles or to highlight under my eyes. My shade is Warm Almond. I like that the creamy consistency makes it easy to work with. A few pats with my ring finger or a concealer brush gets the job done and then I use the pressed powder to set the concealer as well as to highlight underneath my eyes. My favorite part of the podwer is that its finely milled and has a very luxurious velvety texture to it. Although the concealer kit comes in a duo the packaging is small enough to fit in any bag. Also, there’s no fallout from the powder. A little on the pricey side but a little goes a long way. I have never ever had any problems with creasing with this concealer and I get a lot of wear out of it. This concealer kit works wonders. It is sold as a kit specifically because the concealer must be set with a powder. I find that if the concealer is used on its own it tends to cause smudging with my lower lash line and mascara. My only problem with this product is that you can’t buy the powder and concealer separately. This would just have made more sense because the powder lasts much longer than the concealer, in my case at least. Bobbi’s advice is to use the same shade of concealer as your foundation, which I completely agree with! The trend of lighter concealer than foundation just makes no sense to me. Bobbi’s range is great because the shades for all the foundation products are the same. So, if you are shade sand in the foundation, you can buy the same concealer without a worry about clashing shades. Ok, I am a die hard Bobbi Brown fan simply because I love that her makeup is catered for Indian skin tones. This handy concealer is remarkable to say the least. I use the Honey shade and I love how the creamy texture melts into the delicate eye area erasing any discoloration. Now wait for this, the best part is that my eye area looks perfect (no creases of smudges) for hours later. The yellow powder does perform miracles too, it sets the concealer to perfection. Wow! I have always wanted to try this product after hearing such great reviews and having previous users tell me that that it’s amazing. I did go to an Edgars Red Square store to try a sample and I was blown away. It is a little pricey. However, for the wonder it works (especially the brightening effect), it is well worth it. I hope to be able to purchase this product for myself really soon!! 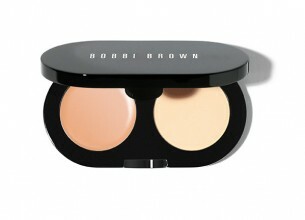 I’ve personally never used Bobbi Brown before, but I have only read and heard good comments about it before. I know what I’m buying next… excited!